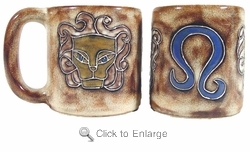 Mara Stoneware Zodiac - Astrology Coffee Mug - Leo is the fixed / fire sign. Leos stubbornly cling to their pride. They do not readily alter their opinions or behavior at the request of others.